Go to original pattern for design DROPS 182-39. The set consists of: Knitted hat, neck warmer and mittens with cables. The set is worked with 2 strands DROPS Air. DROPS DOUBLE POINTED NEEDLES AND CIRCULAR NEEDLE (40 cm) SIZE 8 MM – or the size needed to get 11 stitches and 15 rows stocking stitch with 2 strands on 10 cm in width and 10 cm in height. DROPS CIRCULAR NEEDLE (40 cm) SIZE 7 MM for rib – or the size needed to get 12 stitches and 16 rows stocking stitch with 2 strands on 10 cm in width and 10 cm in height. DROPS CIRCULAR NEEDLE (60 cm) SIZE 8 MM – or the size needed to get 11 stitches and 15 rows stocking stitch with 2 strands on 10 cm in width and 10 cm in height. DROPS CIRCULAR NEEDLE (60 cm) SIZE 7 MM for rib – or the size needed to get 12 stitches and 16 rows stocking stitch with 2 strands on 10 cm in width and 10 cm in height. DROPS DOUBLE POINTED NEEDLES SIZE 7 MM (size S) or SIZE 8 MM (size M/L) – or the size needed to get 12 stitches and 16 rows stocking stitch with 2 strands (size S), or the size needed to get 11 stitches and 15 rows stocking stitch with 2 strands (size M/L) on 10 cm in width and 10 cm in height. DROPS DOUBLE POINTED NEEDLES SIZE 6 MM (Size S) or SIZE 7 MM (size M/L) for rib. See diagrams A.1 to A.4. A.1 is for hat, A.2 for neck warmer. A.3 and A.4 for mittens. Increase 1 stitch by making 1 yarn over. On the next round work the yarn over twisted to prevent a hole. Start decreasing 1 stitch before the marker thread in each side. Place 1 stitch on the cable needle behind the piece, slip 1 stitch, place the stitch from the cable needle back on the left needle, knit 2 stitches together, lift the slipped stitch over = 2 stitches decreased. Decrease in this way in both sides = 4 stitches decreased. The piece is worked in the round with circular needle, change to double pointed needles when necessary. Cast on 56-60 stitches with circular needle size 7 mm and 2 strands Air. Work rib, purl 2 /knit 2 until the piece measures 4 cm. Change to circular needle size 8 mm. Continue working as follows: A.1 (= 14 stitches) and stocking stitch over the remaining 42-46 stitches. Continue until the piece measures 18-19 cm. REMEMBER THE KNITTING TENSION! Insert 5 markers in the piece: Insert the first marker 1-3 stitches after A.1, then the next 4 markers with 8 stitches between each one (insert the markers between stitches, not in the stitches). On the next round decrease 1 stitch after each marker, decrease by knitting 2 stitches together (= 5 stitches decreased) = 51-55 stitches. Decrease every 2nd round a total of 5 times, AT THE SAME TIME on the last decrease, decrease 4 stitches evenly over the cable in A.1 = 27-31 stitches. On the next round knit all stitches together, 2 and 2 = 14-16 stitches. Work 1 round, then knit all stitches together one more time = 7-8 stitches. Cut the strand, pull it through the remaining stitches, tighten and fasten well. The piece measures approx. 25-26 cm. The piece is worked in the round with circular needle. Cast on 96 stitches with circular needle size 7 mm and 2 strands Air. Work rib, purl 2 /knit 2 until the piece measures 5 cm. Change to circular needle size 8 mm. Continue to work as follows: * Purl 6, A.2 (= 10 stitches)*, repeat from *-* a total of 6 times. Continue this pattern upwards. REMEMBER THE KNITTING TENSION! When the piece measures approx. 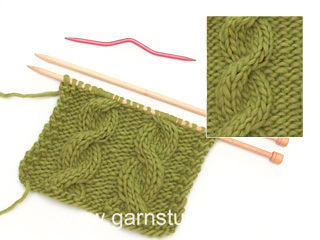 30 cm change to circular needle size 7 mm and continue by working rib, purl 2 / knit 2. Work rib for 5 cm, cast off with knit over knit and purl over purl. The piece measures a total of 35 cm. Size S is worked with double pointed needles sizes 6 and 7 mm. Size M/L is worked with double pointed needles sizes 7 and 8 mm. The piece is worked in the round with double pointed needles. Cast on 32 stitches with double pointed needles size 6-7 mm and 2 strands Air. Work rib, knit 2 /purl 2 for 4 cm. 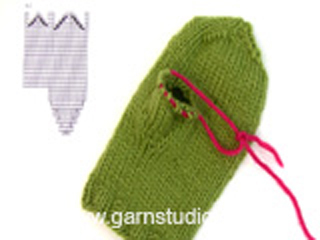 Change to double pointed needles size 7-8 mm, knit 1 round where you decrease 3 stitches evenly on round = 29 stitches. 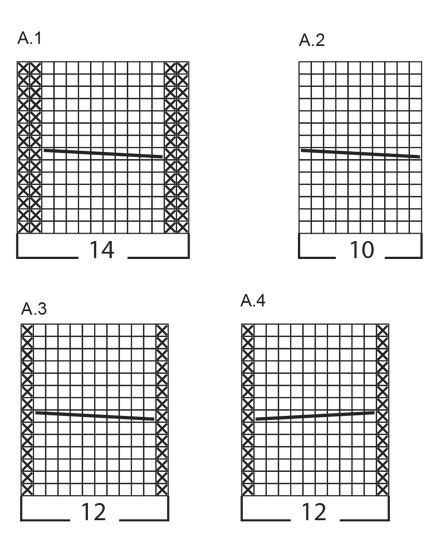 Continue working as follows: 15 stitches stocking stitch, A.3 (= 12 stitches), 2 stitches stocking stitch. Continue this pattern upwards. REMEMBER THE KNITTING TENSION! Insert 1 marker thread in the 11th stitch on the round. When the piece measures 14 cm increase 1 stitch on each side of the stitch with the marker thread, for the thumb gusset - read INCREASE TIP! Repeat the increase on each side of the increased stitches on the next round = 5 stitches in the thumb gusset. Work 2-3 rounds without increases. Then place the 5 thumb stitches on 1 thread. Cast on 1 new stitch behind the stitches on the thread = 29 stitches. Insert 2 marker threads in the piece; in the first stitch and in the 13th stitch (= in each side). Continue with stocking stitch and A.3. When the piece measures 24-26 cm decrease on each side of the stitches with marker threads - READ DECREASE TIP! Repeat the decreases every round, a total of 5 times = 9 stitches left. 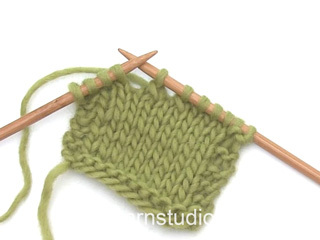 AT THE SAME TIME as you work the last decreases, decrease 3 stitches evenly over A.3, decrease 1 stitch by knitting 2 stitches together = 6 stitches. Cut the strand, pull it through the remaining stitches, tighten and fasten well. Place the 5 thumb stitches back on double pointed needles size 7-8 mm. Knit up 5 stitches at the back of the thumb = 10 stitches. Continue with stocking stitch in the round until the thumb measures 5-6 cm. Insert 2 marker threads in the thumb, in the first stitch and the 6th stitch (= in each side). On the next round decrease on each side of the stitches with the marker threads - READ DECREASE TIP! Repeat the decreases on the next round = 2 stitches left. Cut the strand, pull it through the remaining stitches, tighten and fasten well. Cast on and work as for left mitten, but work A.4 instead of A.3. The marker thread for the thumb gusset is inserted in the 3rd stitch on the round. = place 5 stitches on cable needle in front of piece, knit 5, knit 5 stitches from cable needle. = place 5 stitches on cable needle behind piece, knit 5, knit 5 stitches from cable needle.